'My Boyfriend is a Bear' is a fresh romantic comedy that shirks all the tired tropes of the genre – AiPT! A sweet and fresh graphic novel about a woman, a bear, and figuring out what she wants out of life. 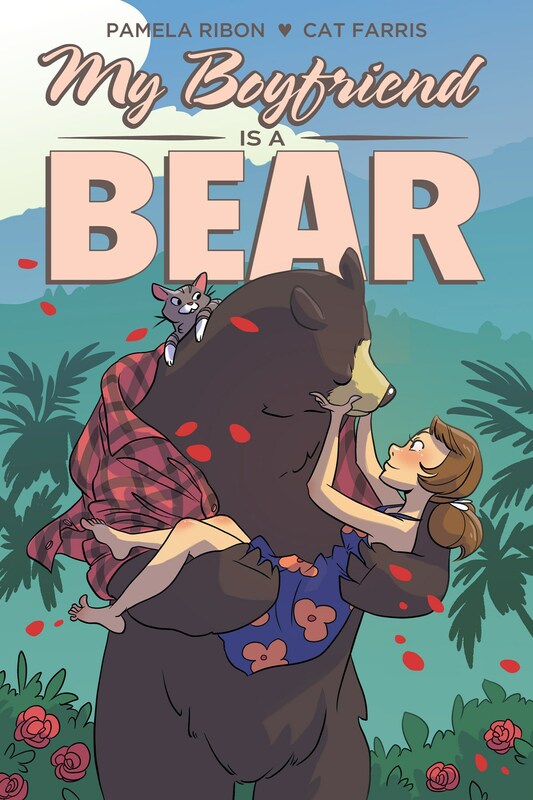 My Boyfriend is a Bear is a new graphic novel from Oni Press about Nora, a twenty-something year old woman who gets tired of the usual jerks she’s dated and decides to give a different kind of love a chance with an American Black Bear. The graphic novel covers their meeting and a year of their relationship as Nora figures out how to introduce her boyfriend to her friends and parents while figuring out a lot about herself and what she wants out of life. Does the book tell a convincing love story even with such an outrageous premise? Who am I kidding? I’ve watched Bojack Horseman. Animals and people dating are nothing new to me. What is new is how completely invested I was in this sweet, funny, emotional gem of a graphic novel. Writer Pamela Ribon immediately established Nora as a charming, nuanced, relatable protagonist and quickly makes a convincing argument as to why Nora would be drawn to the Bear’s kind, caring demeanor. Learning about the Bear’s daily life in Nora’s home is where a lot of the humor emerges, as the book is funny in a way that’s more relatable and down to earth in spite of the fantastical premise. As funny as it is, keep the tissues handy while reading this book as the way Nora’s relationship with the Bear develops is sweet and affecting and her platonic affection for her cat Nutso is also an emotional trip for anyone who’s ever loved a pet. Illustrator and colorist Cat Farris draws the book in a light, almost cartoon-like style that matches the tone of the script while conveying all the nuance and humor it calls for. Each page is packed with details, whether it’s vegetables at market, funny book titles, or posters and clutter in an office space. In one panel there’s a poster referencing Garrus Vakarian from Mass Effect that says, “Space Husband” and I feel very seen. The color choices used throughout keep the book warm and bright. I loved the blushes added to characters’ cheeks and it’s little details like this that make the coloring pop while keeping the overall look of the book simple and clean. Special shout-out to Caitlin Like, Gabriel Fischer, Ron Chan, Allyson Willsey, and Jon Siruno for their color assist work. There’s a storybook-like segment of the book that is executed especially well thanks to the watercolor effect used to add texture and mood to those pages. Another one of my favorite details in this book’s art was how diverse all the characters were. Whether it’s the central cast or people populating the backgrounds at malls or restaurants, the team fills the book with people of different skin tones, body shapes, and orientations and makes each setting feel like a real, lived in world. The Los Angeles of My Boyfriend is a Bear looks and feels like the real place which contributes to the grounded feeling the book works for when establishing its emotional stakes. My Boyfriend is a Bear is a must-read graphic novel for anyone who wants a romantic comedy that shirks all the tired tropes of the genre and offers something that feels fresh, fun, and genuine. I was immediately captured from the title and cover and this book delivered everything I could’ve wanted from it and more. Want to know even more about My Boyfriend is a Bear? Check out our interview with Pamela Ribon and Cat Farris! A heartwarming script and charming art make My Boyfriend is a Bear a super fun addition to anyone’s comic shelf. Don’t miss this fresh, funny graphic novel! Pamela Ribon’s script had me laughing, crying, and fully immersed from begging to end. Nora is a charming, complex protagonist who is flawed, but very likable. The Bear is a charming, complex animal who is a bear and very likable. Cat Farris and the coloring team kept the book bright, warm, and packed with details to pour over in every panel. The main cast and even background characters felt diverse and real in a number of ways.